Punta Sabbioni is near the northern end of the Venetian Lagoon. 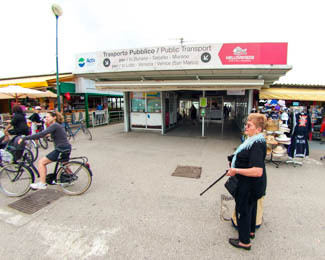 Its busy waterbus station is used by commuters and groups of daytrippers who arrive at Punta Sabbioni's bus parking lots by coach. Except for bars and restaurants, there isn't much of interest near the ACTV station, although the surrounding area does have marinas, residential areas, and farms. We normally don't encourage visitors to stay at Punta Sabbioni (it's a long way from Venice for our tastes), but the area does have a number of inns and other accommodations, including Il Ghebo (three stars), B&B Marechiaro, Agriturismo Ca' Baccan, and the Marina di Venezia Camping Village.